It's look like things are about to get hot between two favorite heroes where the episodes released ranting just got the season three visualize. We are Ready to see Izuku Midoriya and Katsuki Bakugo that want to frame this new poster. A preview poster from the next issue of Pash has gone live. 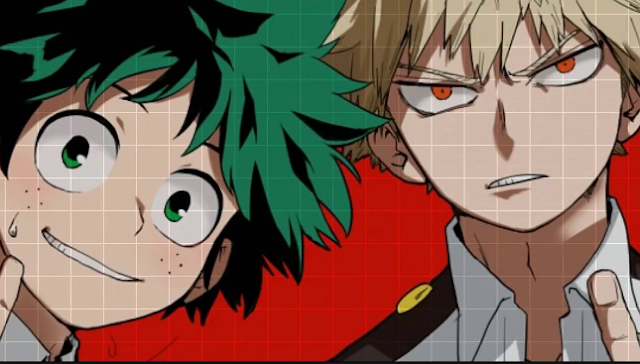 The image features Izuku and Katsuki as the duo stare one another down, and the hot-headed hero looks ready to swing. Clearly, Katsuki has another grievance with Izuku given his hold on the boy, and the pair don’t look like they are ready to make nice. To the left, Izuku is found staring at Katsuki with a rather Worried face, but Izuku doesn’t look near as scared as he did when faced with Katsuki back in middle school. Naturally, Katsuki looks like his fuse is about to blow. The blond-haired boy is seen snarling at Izuku as he holds the other boy up by his shirt collar. Dressed in a black tank top, Katsuki’s bulging arms look primed for a punch, and his fisted hand only adds to the look. This tense poster may seem normal for the duo, but manga readers know the visual is setting up a real big moment. Now that the Provisional Hero License Exam has closed, Class 1-A is waiting to find out who passed, and that information will come to light in this new episode. Readers know the results leaves Izuku and Katsuki in a precious spot, so it looks like the pair will reconcile the issue with their fists rather than words.this tense poster may seem normal for the duo, but manga readers know the visual is setting up a real big moment. Now that the Provisional Hero License Exam has closed, where Class 1-A is waiting to find out who passed, and that information will come to light in this new episode know the results leaves Izuku and Katsuki in a precious spot, so it looks like the pair will reconcile the issue with their fists rather than words.